Has your life been messed up because you were blacklisted for a small debt? Thanks to the new National Credit Act, you can smile again because your life will change for the better. The new Act has been created to protect you from credit givers and to help you understand your rights. 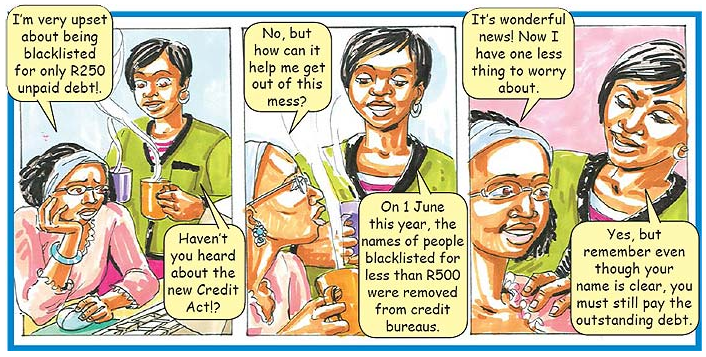 In line with the new National Credit Act, credit information of people who had been blacklisted for failing to pay debts of less than R500 have been removed from the credit bureau on 1 June this year. It means if you had bad credit information because of unpaid debt of less than R500, you don't have to contact the credit bureau to remove your information, it has been removed automatically on your behalf. The new Act also says if you have not paid an outstanding debt for two years by September 2006, and if the credit giver has not handed the account over to lawyers for judgment, all the information relating to that account would have been removed from the credit bureau on 1 June this year. The Act further says if you have debt of up to R5 000 and the judgment was older than 18 months by 1 September 2006, your information has also been removed from the credit bureau. However, it is very important to know that in all these cases information will only be removed from the credit bureau if there are less than two unpaid judgments on your credit record. It is also important that even if the judgment information is removed from the credit bureau's list, you still have to pay your debts. Credit givers can still exercise their rights like taking back furniture bought on credit or take money from your salary to pay the debt. The Credit Information Ombud, said it was still important for consumers to check their credit records in case information had been listed incorrectly or unfairly. A judgment relating to credit is a ruling by a court stating that a person failed to pay debt that should have been paid within an agreed time. 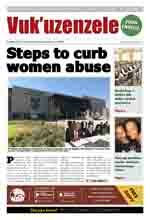 When a judgment is given to a credit bureau it can lead to a person being blacklisted.